Click the image below for a YouTube video demonstrating setup, configuration and a simple custom scene controller (openHAB 1, but still relevant to usage on openHAB 2). This procedure has only to be done once. Now you are ready to go. With the most recent firmware applied (Dec. 10, 2016) the Automatic pairing no longer works in openhab 1.8.3. Pressing the connect button does nothing during the “Waiting for pairing..” phase of openhab startup. 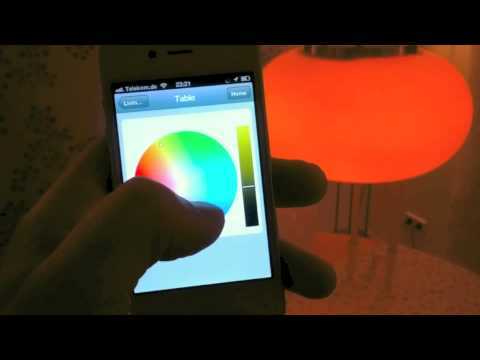 Install the HUE2 app from the Android store onto a phone or tablet or Android emulator. Launch the app. It will ask you to press the Pair button on the HUE, press it, the phone is now paired. This ensures a new secret will be generated for the android app so there are not two devices sharing the same “secret” on the same network. This issue is/will be fixed in Openhab 1.8.4 or 1.9-SNAPSHOT. This binding can be configured with the file services/hue.cfg. ip preferred IP address of the Hue bridge. If it is not provided, the binding tries to find the bridge on its own. This may not always work perfectly. The preferred way should be a defined IP. secret Yes a string that gets stored in the hue bridge when pairing it with openHAB. That way the bridge ‘knows’ openHAB and allows it to send commands. It is kind of a password. Be aware that it is not encrypted in the communication. You may change this value to anything you like using characters and numbers. It must be between 10 and 40 characters long. refresh No defines the polling interval in milliseconds (1000 milliseconds = 1 second) to retrieve Philips bulb status. Polling is enabled if refresh is specified. Be aware that polling will consume resources, so a small refresh interval will increase CPU load. Other apps can change Hue status or a physical switch can turn on / off lamp status. If this happens the status of hue lamps within OpenHAB won’t reflect the real status. Currently (September 2014) there is no push technology available, so the only option is to poll Philips bulbs to retrieve status and update items accordingly to reflect changes. In order to bind an item to a Philips Hue bulb, you need to provide configuration settings. The easiest way to do so is to add some binding information in your items file. The syntax for the Philips Hue binding configuration string is explained in the following sections. The switch item is the easiest way to control your bulbs. It enables you to turn on and off your bulbs without changing color or brightness. The bulb number is assigned to the bulb by your Philips Hue bridge. The numbers should start with 1 and increase for every connected bulb by 1. If you have a starter kit, the first bulbs are numbered 1, 2, 3. The color item allows you to change color and brightness of a bulb. Change the white color temperature of a bulb from warm to cold. Dimmer <Item_Name> hue="<bulb number>;brightness[;<step size>]"
where the part in  is optional. The step size defines how fast the dimmer changes the brightness. If no value is defined the default value of 25 is used. Dimmer <Item_Name> hue="<bulb number>;colorTemperature[;<step size>]"
The step size defines how fast the dimmer changes the color temperature. If no value is defined the default value of 25 is used. Switch         item=Light_GF_Lounge     label="Lounge Light Switch"
Slider         item=Light_GF_Lounge_T   label="Lounge Color Temperature"
By adding a visibility tag (see [[Explanation-of-Sitemaps#visibility]] for more) we can hide the widgets for the color, brightness and color temperature if the light is not on. Switch         item=Light_GF_Lounge                                          label="Lounge Light Switch"
Colorpicker    item=Light_GF_Lounge_C    visibility=[Light_GF_Lounge==ON]    label="Lounge Color"
Slider         item=Light_GF_Lounge_B    visibility=[Light_GF_Lounge==ON]    label="Lounge Brightness"
Slider         item=Light_GF_Lounge_T    visibility=[Light_GF_Lounge==ON]    label="Lounge Color Temperature"
The LivingColors remote is only compatible to Philips branded bulbs. We can’t control for e.g. Osram bulbs with this remote. However the Hue Bridge can control these bulbs, since it fully supports the underlying ZigBee protocol - I guess the LivingColor remote and Philips bulbs use some proprietary protocol to communicate with each other. I use one of my LivingColor remote’s scene for a sunset-like ambience. The following rule basically listens for a certain hue value from one of my Philips bulbs (which can be controlled by the remote) and if these values match (=when I activated the sunset scene) it sends a command to the unsupported bulb. This turns on the light with a delay of several seconds, since OpenHAB polls the values from the bridge every few seconds and while the bridge itself is also just polling the values.